Some people like to drink dessert. Last week we discussed the Brandy Alexander, a delightful mix of cognac (or brandy), crème de cacao, and heavy cream. Switch out the cognac for green crème de menthe and you have the Grasshopper Cocktail, which may be the ultimate dessert drink. Chocolaty crème de cacao and minty crème de menthe are both sweet. Add cream, and you have a rich drink that tastes an awful lot like one of those dinner mints you sometimes see — such as Andes Chocolate Mints. And although both crème ingredients contain enough alcohol to provide some grown-up pleasure, the total amount is perhaps half of what you’d get in a regular drink. So after a big dinner with lots of wine, you’re not adding too much more to your total intake. Best of all, the festive green color of the Grasshopper is seasonally appropriate. 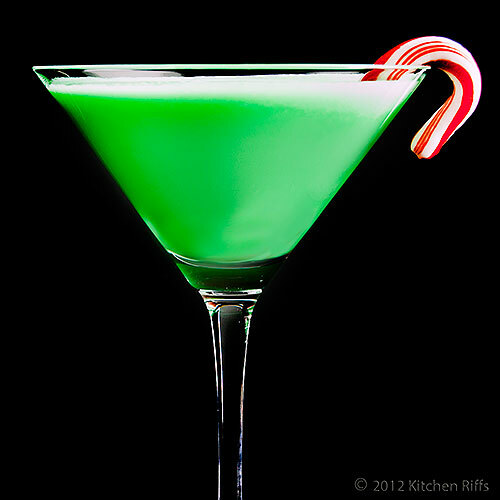 Add a candy cane garnish, and this drink just screams Christmas. Most do people agree, however, that the drink originated at Tujagues Restaurant in New Orleans, where it was developed as an entry for a cocktail contest held in New York City in 1928 — during Prohibition! It’s puzzling that someone would hold a cocktail contest during Prohibition — but of course it’s even more puzzling that we ever had Prohibition. The classic recipe for this drink contains equal parts of crème de menthe, crème de cacao, and heavy cream. I find this makes a well-balanced drink with excellent flavor, and it’s the formulation I prefer. But this is a cocktail that invites tinkering — so feel free to adjust the quantity of ingredients to reflect your own taste. My recipe tastes an awful lot like a liquid dinner mint. But you might decide you prefer something that’s more like melted chocolate mint ice cream. I suggest some alternative ingredient ratios in the Notes to get you started on your tinkering. This cocktail takes about 5 minutes to make, and the recipe serves 1. 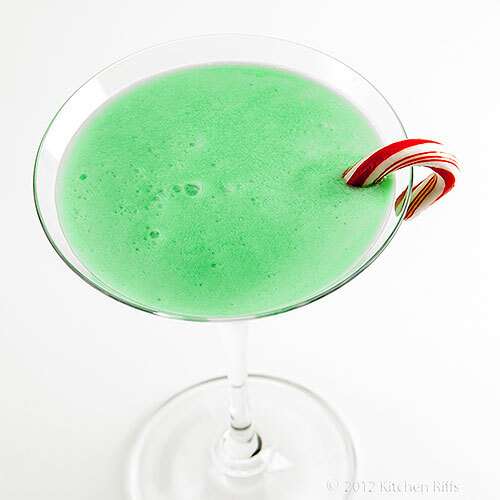 Add a candy cane garnish if desired, and serve. Crème de menthe is bottled as either a white (clear) or green liquid. The flavor is the same. You definitely want the green for this drink, to give it color. Crème de cacao is bottled as either a white (clear) or brown liquid. The flavor difference between them is very slight, and when mixed in this cocktail I can’t distinguish between the two. I buy the white version because some other drinks that require crème de cacao are best made with that variety. You definitely want the white version for the Grasshopper; the brown would make the drink rather muddy. You can find crème de menthe and crème de cacao at almost every liquor store, in the liqueur and cordial section. The most commonly seen brands — DeKuyper and Hiram Walker — cost around $10 per bottle. The flavor of these is acceptable, and the quality is decent enough. If you don’t mind spending twice as much (or more), Marie Brizard is a good step up in quality and flavor (it also has a somewhat higher alcoholic proof). If I used either crème de menthe or crème de cacao a lot, I’d be buying Marie Brizard. Because I so rarely use these liqueurs, I usually buy the inexpensive brands (although recently I impulsively bought a bottle of Marie Brizard crème de cacao just to confirm that the more expensive brand actually is better. It is). If you want to tinker with the quantity of ingredients in the Grasshopper, I have two suggestions. For a drink with a bit more cream, try making it with an ounce each of crème de menthe and crème de cacao, and 2 ounces of cream. If you find the drink has too much cream as is, try making it with 1½ ounces each of crème de menthe and crème de cacao, and 1 ounce of cream. BTW, the drink becomes a bit lighter or darker depending on whether you use more or less cream. Likewise, if you add or subtract crème de menthe. David A. Embury in The Fine Art of Mixing Drinks claims that the original Grasshopper was a pousse-café (that is, a layered drink — one of the most common of which today is the B-52). He says it originally consisted of layers of crème de menthe and crème de cacao, with an additional cream layer being optional. That would be pretty, but I’d rather have my Grasshopper mixed and served in a cocktail glass rather than layered in an oversize shot glass. Perhaps not surprisingly, there are ice cream versions of this drink. Most typically, they contain mint chocolate chip ice cream (suggesting the flavors of both crème de menthe and crème de cacao), along with actual crème de menthe, and usually some milk. Some people use mint ice cream sans chocolate chips (or even plain vanilla), and then add crème de menthe and crème de cacao. The idea is to blend the ingredients and serve it in a tall glass, with straws. Kind of an alcoholic ice cream soda. It’s not something I’ve ever made — or am likely to make — but you might find it fun to experiment. Speaking of ice cream, crème de menthe makes a wonderful topping. Not for the kiddies, however, since it does contain alcohol. “Which is?” Mrs K R asked. Ah, another awesome cocktail that reminds me of my grandmother. How fun and festive! Ooh I want to make this. Alcoholic beverages have never been something I ever learned to master but with these past that you've posted I can't wait to try them. I think I will surprise my family with this Christmas Day - we're all of age now. YUM! You need to write a book John! Hi Alyssa, this really is a fun cocktail, isn't it? And the flavor is wonderful. Thanks for the comment. Hi Vicki, this is a great drink - tons of flavor, and not too much booze in it. A lot of fun to drink. I doubt if I'll ever even think about writing a book (I could do it, but I used to work in publishing so I know the payoff for all but a handful of authors just isn't there), but thanks for the encouragement. And for the comment. Most definitely screams Christmas. And I love mint! Ho! Ho! Ho! Hi Abbe, ho, ho, ho indeed. ;-) Isn't mint such a great flavor? And it pairs so well with chocolate. Thanks for commenting. What a fun festive drink! Perfect for sitting out on the verandah on Christmas Eve. Looks festive, friend! I would like be having both and not wait for Christmas even :) Can't wait to see the next week's reveal! Hi Kristi, isn't this pretty? And it's really flavorful, too. You definitely owe yourself one, after your finals are over! Thanks for the comment. Hi Clare, that's the ideal place to be sipping one! Thanks for your comment. Hi Christine, isn't it pretty? And I agree with you on minty flavors - so refreshing and flavorful. Thanks for your comment. Hi Ilke, no need to wait for Christmas! Practice is always good, right? ;-) Thanks for the comment. Hi Bam, isn't this a great drink? And not one that I see all that much any more. Thanks for the comment. Another blast from the past, John. I can't even tell you the last time I saw a bottle of crème de menthe in a friend's bar, let alone saw a grasshopper served. It's a shame because something that tastes of a little mint is a great way to end a meal. Thanks for sharing another great cocktail recipe. I remember my parents drinking these! Definitely yummy and festive! And I've been looking for a decent brand of creme de menthe, so I appreciate your Marie Brizard recommendation. Brilliant color!!! I love minty flavor and think about it with heavy cream, I can almost taste it :). Ah, another dessert drink and so gorgeous. Again, it brings back memories of the days when I used to go to the pub with friends and sample all sorts of cocktails. I really need to use Christmas as an excuse to try some of your latest cocktails. Made into an ice cream would be over-the-top wonderful. Hi John, these blasts from the past are kinda fun, aren't they? This isn't a drink I'd want to make a regular, but it's a lot of fun from time to time. Thanks for the comment. Hi Lizzy, these really are festive, aren't they? And when it comes to quality for crème de menthe (or crème de cacao), the French brands of liqueur tend to be the best, at least that I've tasted. Marie Brizard is probably the easiest to find, although there are others out there (they'll all cost over $20/bottle). Thanks for your comment. Hi Shibi, isn't that color fun? And this is one of those drinks that does taste pretty much the way you imagine it will. Thanks for your comment. Hi Suzanne, this is indeed a gorgeous drink. And using Christmas as an excuse to try some cocktails always works around our house! Thanks for your comment. I like the look and name of this cocktail. Very cute and Christmas-y! Lol to Mrs. KR, really, who cares?! I just love her respond. :) Oh holidays, is it here yet? Hi Zoe, this really is a super Christmas cocktail - the colors are perfect! Thanks for the comment. I have had the milk shake version of this drink at my aunt's home. She made them with vanilla ice cream for dessert. It was delicious. I love drinking my dessert! For some reason I've never made a Grasshopper though - time to rectify that. It looks crazy good! Hi Biren, it really is a festive looking drink. And the flavor is pretty festive, too. ;-) Thanks for the comment. Hi Ali, the candy cane would normally be too much, but not during December! Thanks for the comment. Hi Karen, I really should try the ice cream version sometime. The regular drink is so good, I'll bet the shake is great! Thanks for the comment. Hi Kristy, it's a good drink. Probably not one you'll one to drink every day or even every month, but it's fun to have occasionally. Thanks for the comment. What a lovely and festive drink! Will try this for the holidays. Hi Asmita, this cocktail really is perfect for the winter holidays! Definitely worth trying - you won't be sorry. Thanks for the comment. Hi Natalie, yeah, they're probably going to ruin me, too. ;-) Fun way to ingest calories, though. Thanks for the comment. I have never heard of a grasshopper, probably because I have never been to the USA. I love the look of it though I am not sure I would be tempted to even take a sip. The thought of drinking an after-dinner mint is just not the sort of cocktail I'm after. Though my family sisters would love it. It is definitely Christmasey and the candy cane is a perfect addition. I am going to vote for the Brandy Alexander. Hi Judy, sorry for the wait. ;-) Isn't this a nice looking drink? 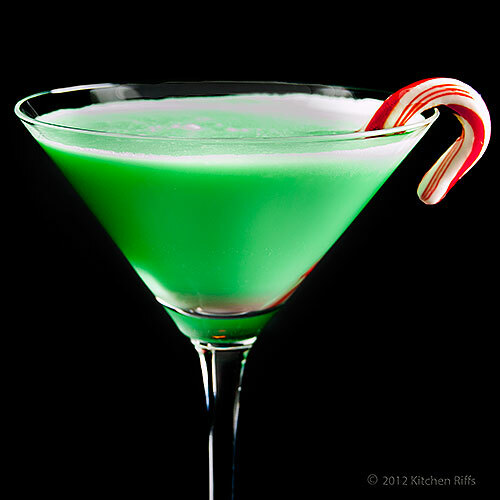 And I agree the candy cane is a fun garnish. Thanks for the comment. Hi Liz, I totally understand that this drink might not float your boat. Although I think after you had a sip you might change your mind. However, it's hard to turn down a Brandy Alexander. If it came to it, that would probably get my vote too. Thank goodness I can have both! Thanks for the comment. Hi Chris, aw, shuck, thanks so much for those very kind words. And for commenting! Wow, that looks pretty amazing. I'm trying to remember if I ever had creme de menthe but I actually think not, so a good reason to try it out right? The color is totally awesome... And indeed perfect for Christmas. Thanks also for your suggestions on my photography block... I think it's a great suggestion so I might focus on that for a while! What a lovely color! That is an amazing cocktail. Thta is such a Xmassy combination. 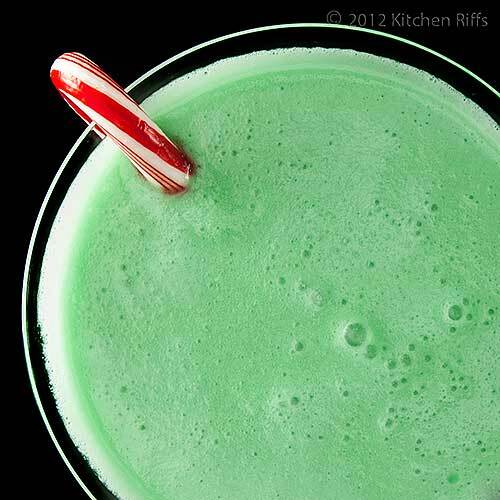 Your photo of this drink instantly reminded me of Christmas elves! How cute! So festive! I think both kids and adults would enjoy this. Love the addition of a candy cane. Just perfect! Hi Simone, doesn't this cocktail have great color? IMO, that's reason enough to give it a try! And glad you found my suggestion helpful (although your photography already is light years beyond most people's). Thanks for commenting. Hi Rosa, this cocktail is really all about its color! And the color is gorgeous. Thanks for the comment. Hi Holly, this does say Christmas elves, doesn't it? This drink has about half the amount of alcohol as a regular drink (probably a bit less than that) so you could probably give a child a small serving. Or maybe for kids make an ice cream version - just a bit of the crème de menthe adds an awful lot of color. And the candy cane really does add a nice touch, doesn't it? ;-) Thanks for the comment. My mother-in-law turned me on to grasshoppers when I was 18 (18 was legal back then :)) and dating her son. I loved, loved, loved it, but it went down WAY too easy! After marriage, it became a tradition to give her a bottle of crème de menthe each year, and of course, I had to buy one for myself as well. I love the candycane garnish! Makes this the perfect Christmas eve cocktail in my book! And then of course the Brandy Alexander for Christmas day - great idea! I've never had a grasshopper cocktail and now I want one. It does look perfect for Christmas. Thanks for sharing! Hi MJ, I remember when it was legal in the US to drink at 18. ;-) Have fun with these on Christmas Eve, and Brandy Alexanders the following day! Thanks for the comment. Hi Nancy, this is definitely fun to try! And it's perfect for dessert. ;-) Thanks for the comment. Hi Lilly Sue, if you want a holiday drink, I have lots! And tons I haven't yet posted - this will likely go on for years. ;-) Thanks for the comment. Looks like the perfect drink for the holidays. I would love to have one or maybe two for the holiday!! Hi Carolyn, we definitely should leave one out for Santa. ;-) He'd be delighted to receive this. With a cookie, of course. Thanks for the comment. Hi Dawn, it's a really nice drink. A tad on the sweet side, though - one usually does me. Thanks for the comment. The candy cane looks absolutely perfect on your grasshopper! Looking forward to seeing what your next drink suggestion is. Hi Terra, it's really a quite decent drink. Sweet, but that makes it ideal for dessert. Thanks for the comment. Hi Beth, isn't the candy cane a nice touch? ;-) Great for Christmas. Thanks for the comment. The grasshopper cocktail always makes me smile! What a vibrant and fun colour. Hi Amanda, isn't this just a gorgeous looking cocktail? And fun to drink, too. What more could you ask for? ;-) Thanks for the comment. Wow, the color is terrific! I love how you mention the history of stuff you make. I'm learning :) I have never even heard of a grasshopper cocktail before! Hi Cathleen, glad you enjoy the bits of history I include! And this is a fun cocktail to try. Thanks for your comment. I love mint anything, so this holiday drink is right up my alley! I love the candy cane on the side. Perfect touch! Hi Raymund, this really does look like Christmas, doesn't it? Thanks for commenting. Hi Kristi, if you like mint, this cocktail has your name on it! Lovely dessert drink, and I agree the candy cane is kinda fun! Thanks for your comment. Thanks for the history on this cocktail! I've made a ton in my day but never thought to research how it came about. I'm one of those weirdos that don't like mint messing with my chocolate but other people love it. Lovely color. Hi Food Jaunts, a lot of people don't like the mixture of mint and chocolate, but I find it pretty refreshing. Isn't that color terrific? That's (almost) reason enough to have one! Thanks for the comment. I could not ignore this...awesome and festive drink...I absolutely love it! Hi Juliana, this drink is so much fun to drink! It has great color, and such an amusing name. ;-) Thanks for the comment. interesting historical fact, that it was created for a Cocktail competition during the Prohibition. People really get creative when they need to find a disguise for alcohol. The pastel green reminds me of a kids drink. Yet I don't doubt, that it will bring me much joy. Hi Helene, it does rather look like something kids would drink, doesn't it? Although there's most definitely booze in it! ;-) Thanks for the comment. Another awesome cocktail recipe that I missed! Love the color and how festive this looks, especially with the red and white candy cane in it (with the green color). Hi Nami, doesn't this cocktail have wonderful color? And it's so much fun to dress it up with a candy cane! Thanks for the comment.